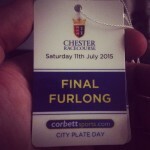 Last week I attended Chester Races, as I do every year. Who me.. Cracking view, Racing Post, beer required. I’ve also just go back from the Annual Race Trip from Ripon with the lads, ‘dear me’ more on that later, back to Chester for now. Well events at Chester didn’t get off to the best of starts as someone crashed into my car, lucky not to bad and still drivable, no one was hurt and the bloke admitted liability, which he later revoked once he called his insurance company. 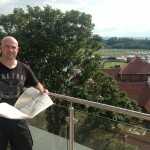 At Chester I was a guest of James Fitz who very kindly booked me into a great apartment for me and the missus. 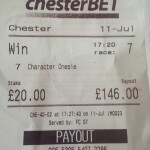 Again Chester is a decent winning course for me and once again I managed to come out over £350 quid up which ain’t to bad especially when the afternoon’s drinking kicks in and you struggle to remember which pocket you placed your selection card in. First race won really as expected, Second was leading and winning all the way to the line although he had pressure from a ride on his outside and I just knew he was going to get beaten, sometimes I hate it when im right, beaten on the line by a nose. Could be worse I suppose, like being beaten by a golf club, now that would sting a bit. Anyway, 3rd race selection crossed the line back in third place, 4th, 5th and 6th race all won, the last race was a nice one to finish on at on 7/1. See the betting slips which I took a few photos of for you, don’t ask me to ever take a holiday pic for you. I’ve added some video as well, I make no excuses in the video for me looking slightly worse for wear as the day went on, I blame it on the long drive down. James Had A Flutter, It Only Went On To Win. If it wasn’t for that second race nose it would have been an even better day, although I can’t take credit for the 4th race which James selected, I couldn’t convince him to stick more than a fiver on it though. 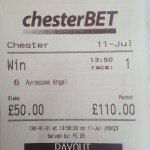 My winning ticket for the 4th race has vanished which is quite annoying as im sure I took a photo for you. I’ll check the old suit jacket see if it’s hiding away. Going though the full card at one particular track is really never advised, however when you are at the track for the day it’s a must do. Sometimes it goes really well and sometimes it doesn’t, but the most important part is having a great day at the races. I did mention Ripon races and it once again proved to be an eye opener, not quite as refined shall we say as Chester, still great fun though. I like a few beers but dear me, fully grown pot bellied blokes in full tracksuits lying around the race course before the last race is really something to see. I never stopped laughing till I got back on the coach, the amount of drunk people falling over made Ripon races a You’ve Been Framed poachers paradise. 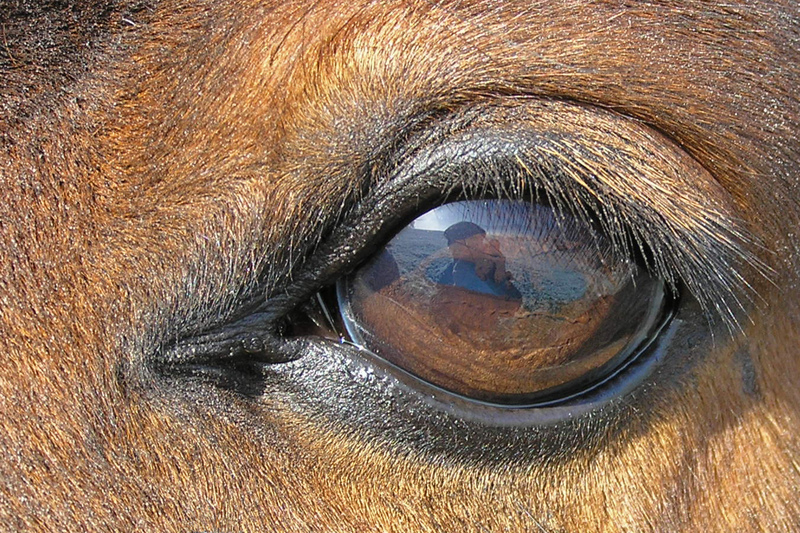 Anyway the day at Ripon was less successful as ever really, I don’t like the course, I’m not entirely sure the horses do either to be honest, you can’t see a damn thing. 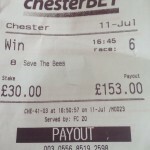 I managed 2 wins on the day, the second win coming my way from a horse I backed a Chester the week earlier Save The Bees. Who says it doesn’t pay to follow horses. From 6 races with what would have taken me up to 3/6 on the day, just wasn’t meant to be when my last horse just got pushed out of first place by a short head on the line. So I ended up £50 quid down. 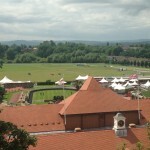 Still a great day and I tip my hat to anyone picking winners at Ripon. Oh the guide dogs, I almost forgot, as we left Chester, the Guide dogs were outside collecting, which is great. Last year if you remember they got all the bookies money from me, however this year my round was due at the bar, I still stuck a handful of notes in. We were there for about half an hour while my missus chatted and fussed the dogs. I heard someone ask how long has the dog been blind, I mean really, COME ON..! I don’t really bet crazy anymore by that I mean large amounts, the reason is because I cannot commit my days fully to races and form study like I used to. 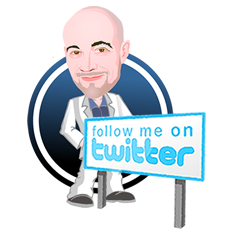 Running this site and working on software development and finding new racing angles for you the betting public is my priority these days. Please don’t feel sorry for me I still have a good go at winning when I have the chance, although I didn’t bet any bigger than £50 on my recent trips. 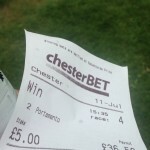 I was surprised though that me Placing a £50 quid bets and collecting the winning was a massive, Wooooo wooooh moment for the people behind me in the queue, at first I though they were taking the p**s. I know it’s a lot of money to some folks and at the end of the day it’s still £50 quid, it’s a meal out with the missus at the local Italian’s, wine not included. I’ve stood at the bookies window enough times to know plenty punters bet £100, £200, £500 on a race day with usually little knowledge of what they are doing but lots or normal punters bet fivers and tenner and that’s totally fine. You don’t need to bet big to win or have a great time. Some people think they must bet big to win big. Sometimes this is true but more importantly than this hit and hope mentality is to develop a strategy to win consistently and to have a method which allows you to feel confident, very important. That’s not to say I didn’t do well back then I did. Of course I did lose large amounts at times as well, but it never put me off. It’s the nature of the beast in which we play. It really never bothered me losing a grand on a race, I know that sounds very blasé but it’s totally true, I just went straight back to the computer for the next race. In the end my confidence and handwork paid off and I never suffered from that weak mindset many punters run from when they lose a few races. Dig deep when you have to and keep focused, this is probably the best advice I could give you. If you can’t stand even losing £2.00 then maybe betting isn’t for you. If you have a good working method things will turn around and balance out. If however you are generally throwing money left, right and centre then you will end up broke and disillusioned with racing forever, and blame everyone else but yourself for your failures. Now all this is great and what not, but how can I help you today, well you tell me.! 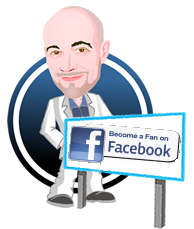 You have the ability to post any comments on this site and I will read them and post them on the blog for you and hey together we maybe able to figure somethings out in your betting, I’m pretty sure I can help you. 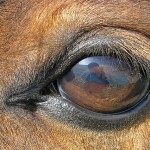 I recall that race and was on the horse. I renamed it ‘Save the Bacon’ as that’s what it did on the day!